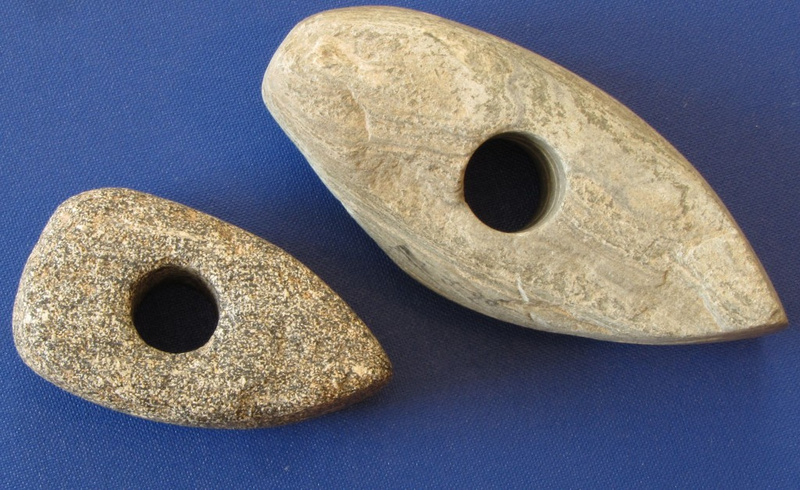 These are two small middle Neolithic axes from Northern Hessen, found near Kassel. In controversial hypotheses, there have long been speculations attempting to explain the spread of the farming lifestyle from the Fertile Crescent to Europe: via idea transfer and acculturation, or even through different forms of infiltration by foreign civilizations in central Europe. Samples of old DNA from a burial ground at the Early Neolithic Derenburg-Meeresstieg II LBK-site in the Middle Elbe-Saale region about 160 km Northeast of Kassel indicate that the “Neolithic package” in central Germany may have been brought by Immigrants from the Levant . The main finding of the study were the first molecular genetic proof indicating that the genetic profile of the early Neolithic settlers had strong similarity with populations currently living in the Near East. Later studies from the vast LBK interaction sphere followed and confirmed these results. After establishing the first farming communities during the LBK- and Rössen phase, the Neolithic “cultures” of Northern Hesse are influenced by the Michelsberg culture between 4100 and 3500 BC. The following Wartberg culture, a regional complex found in northern Hesse and eastern Westphalia with its famous gallery graves has been dated 3700 and 2,800 BC. This regional complex is followed the Corded Ware, which shortly after was confronted with the ideology of the Bell Beaker Culture. These two small axes (7 and 11 cm) shown here, found 10 km apart most probably come from a Michelsberg context or are from the very late Neolithic. Such items are neither known from the LBK- and Rössen phase nor from the Wartberg phase. Note that this post was written before the Anatolian / Levantine migration of first European farmers was finally proven on larger DNA samples.